I do like Janine Di Giovanni's reporting style. She's compassionate without being sentimental, her images vivid but not overly dramatic. Compared to other books about wars in the former Yugoslavia, hers truly shine. 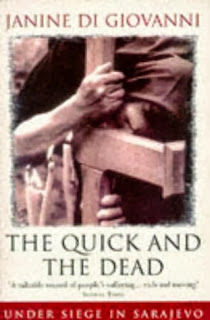 The Quick and the Dead is a tiny booklet, only 177 pages. It is fully focused on the infamous siege of Sarajevo. Between 1992 and 1994, Di Giovanni made repeated trips to the suffering city. As you can probably imagine, her reports are not too happy. War doesn't paint beautiful pictures. Still, stories of ordinary people in exceptional circumstances are very powerful. Sure, fear and horror were omnipresent, but if you looked hard enough, you could also find defiance, dignity and courage. The bittersweet mixture, when described by a skilled writer, touches the heart. Funny thing, if I were to label The Quick and the Dead as a single genre, I would choose travel writing. The good travel writing, I hasten to add, like Dervla Murphy's, not some magazine-sponsored holiday-in-the-sun gibberish. Di Giovanni is an active participant in the events, always on the move from one location to the next. She shares her worries, fears, heartbreaks, and if the story she's about to relate is somebody else's, she describes where and how she met the source.